Even though it was for my birthday, I let my mom pick where we should go. So we ended up going to Nagwon Garden, one of our local faves. We’re pretty boring when we go eat korean food. We don’t usually order anything wacky or experiment. We stick to what we know, what we like, and what’s good. 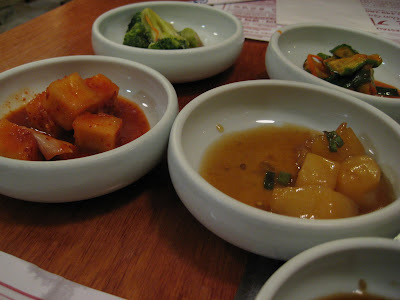 None of the banchan was particularly outstanding, but they were all pretty good. 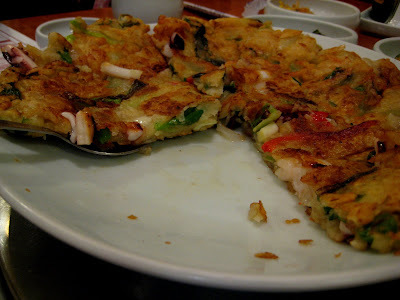 We ordered the haemulpajeon (seafood pancake). I’ve always liked it here. It’s not too thick, everything is cooked all the way through, and it’s chock full of seafood, including squid, which is my favorite part. 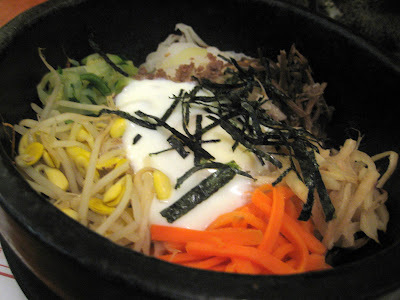 My mom went with dolsot bibimbap, one of her ol standbys. I had a little bit of it, and it was pretty good, as usual. I love the burnt rice bits on the bottom. As for me, I wanted something super hot since it was bitterly cold, so I went with jjamppong, a spicy seafood noodle dish. It’s one of my absolutely favorite dishes in the world. 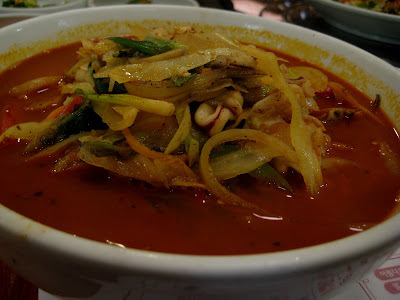 It’s full of seafood, veggies, and thick wheat based noodles in a spicy broth. This particular one wasn’t nearly as spicy as it looked. 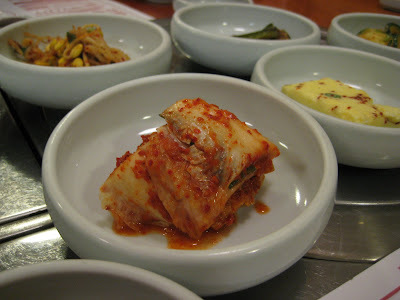 Jjamppong is actually considered a Korean Chinese dish, but whatever it’s considered, I dig it. Service was on par with other korean restaurants, meaning ok. On this particularl night, we were the only people dining in the place. It was a bit weird. But I blamed it on people being glued to their seats awaiting the Lost season premiere or just staying indoors and keeping warm. I did see some takeout orders going out.